Mesothelioma survivors offer hope to those diagnosed through their inspiring stories and shared experiences. Breakthroughs in treatments give patients hope for long-term survival. Though prognosis is poor, there are long-term mesothelioma survivors. Patients must maintain checkups and monitoring after finishing treatment. There are a variety of support resources for mesothelioma survivors. While there is no cure for malignant mesothelioma, there is hope in the stories of long-term survivors. Many patients have undergone extreme treatments with the support of experienced mesothelioma specialists and their loved ones, allowing them to overcome the deadly disease and live full lives. Facing a mesothelioma diagnosis and going through an array of aggressive treatments can substantially change a patient’s life. From being out of work to emotional strain with family and loved ones to the toll on the body, patients often seek to find a “new normal” after beating their cancer. Despite ridding cancer from the body, patients are still likely to face an array of side effects, both mental and physical. Ultimately, the side effects that one experiences will differ on a case-by-case basis. However, there are some common side effects worth considering. While the potential side effects may seem overwhelming, there are many coping methods patients should consider including maintaining a healthy diet, staying physically fit, asking for help from others, doing memory activities and brain exercises, and keeping a journal to document their experience. Palliative treatment may also be an option, as well as supports like counseling or occupational therapy to help maintain a high quality of life. Hearing the stories of mesothelioma survivors can help patients find hope and relatability with others that have battled and won their fight against the cancer. Heather was diagnosed with malignant pleural mesothelioma in 2006, at only 36 years old after just giving birth to her baby girl, Lily, three and a half months earlier. Originally given just 15 months to live, Heather knew that wasn’t an option. With the support of her husband, Cam, they traveled to Brigham and Women’s Hospital in Boston for a newer, risky mesothelioma treatment option: surgery that would remove her left lung and the cancerous lining of the lung (extrapleural pneumonectomy), and replace her diaphragm and lining of her heart with surgical gore-tex. After surgery, Heather faced chemotherapy and many rounds of radiation that proved extremely difficult on her body, but the risky treatment paid off; Heather has been cancer-free for 11 years. Connect with Heather. Mavis was told she had only 3 months to live when she was diagnosed with mesothelioma in 2006. In her home in the UK, the standard treatment for mesothelioma is a chemotherapy drug called Alimta, but after months of this treatment, her tumors started to grow back. Growing weaker from the aggressive cancer, Mavis sought out clinical trials. After joining a few that didn’t work for her case, Mavis joined a trial testing an immunotherapy drug, Keytruda. Mavis experienced remission after a successful round with Keytruda, and continues her battle against mesothelioma with hope, offering inspiration to other mesothelioma warriors. Evolutionary biologist and paleontologist Stephen Jay Gould was diagnosed with peritoneal mesothelioma in July 1982. Through his interest in research and statistics, he discovered that the median survival for the disease was just 8 months, but, that the odds were in his favor for living beyond the statistic. His discovery led him to pen the important article “The Median Isn’t the Message,” which remains a source of hope for cancer patients today. Gould survived for 20 years after his diagnosis and ultimately died of an unrelated lung cancer in 2002. Paul Kraus was given just weeks to live after his peritoneal mesothelioma diagnosis in 1997. He had been exposed to asbestos as a young boy in Australia, which has the second-highest mesothelioma death rate in the world. Kraus decided to undergo more unconventional treatment methods, turning to a strict diet and other alternative medicine in an attempt to halt the disease. With success, Kraus is the longest-living mesothelioma survivor today. David Curtis was being treated surgically for a hernia, when his doctor found a peritoneal mesothelioma tumor. David did not have any symptoms, so his diagnosis came as a surprise and was later linked back to frequent exposure to asbestos as a child. He underwent a drastic surgery, removing his peritoneum, omentum and abdominal organs, along with a heated chemotherapy wash. After a long recovery, David soon went back to work full-time, a peritoneal mesothelioma survivor. Though now fully banned in the UK, the hazards of asbestos exposure are still emerging in patients diagnosed with mesothelioma years after their exposure, as was the case with Stephen Henley. As a geologist, Henley traveled to a chrysotile asbestos mine and processing plant, where he faced a one-time exposure. After experiencing mild symptoms and seeking a checkup before a large trip, Henley experienced early detection of pleural mesothelioma. With surgery to remove his pleura and radiation therapy, Henley is now a long-term mesothelioma survivor, enjoying his life with his wife and family. When planning their journey ahead, survivors should lean on the support options available to them for peace of mind and to get answers to any of their questions. There are many support groups and community resources available to both survivors and patients to help them through their journey, during and after treatment. The American Cancer Society offers a plethora of resources to mesothelioma patients and survivors. A place for counseling, support groups, education and financial assistance, CancerCare has a section dedicated to post-treatment survivorship. The NCCS offers many resources for cancer patients and cancer survivors, such as a “survivor toolbox” and additional reading materials. 1 American Cancer Society. Survivorship: During and After Treatment. 2 American Cancer Society. What Long-Term Cancer Survivors Want to Know. 3 Bates GE, Hashmi AK, Bressler, et al. 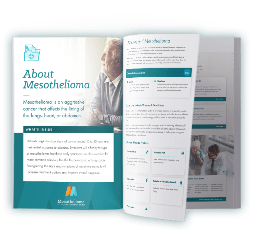 Approach to offering remote support ot mesothelioma patients: the mesothelioma survivor project. Translational Lung Cancer Research. June 2016;593):216-218. doi:10.21037/tlcr.2016.05.05. 5 National Coalition for Cancer Survivorship. Cancer Resources. Page last modified on September 14, 2018.